Spent the week of the 4th out in Colorado riding Winter Park, Copper and Keystone. Winter Park and Keystone are more DH bike resorts with tons of trails while Copper only has a couple of trails but if you like fast and flowy trails and no crowds then Redtail at Copper is a lot of fun. It's also only $15 to ride the full day at Copper, can't beat that price. Winter Park is good but the condition of the trails didn't seem great. Tons of braking bumps entering the berms and the tabletops need some attention. We were there on the 4th so it was definitely the most crowded. Only found one terribly challenging trail, Trestle Downhill which is a double black but nothing crazy if you've ridden places like Sunday River or Bromont back east. Amazing fleet of rental equipment at WP, if I were to go again I wouldn't bother shipping my own bike. Keystone was a blast. Not sure how to describe it but a mix of traditional back east stuff (not Highland) with some crazy bridges like Whistler has including the corkscrew. Sections of High Speed Dirt and Jam Rock remind me of the ridiculously steep sections of some of the older Sunday River trails and Bromont trails and even the old Mt Snow Yardsale (minus the volkswagon sized boulders). Best of all is that the elevation has got to be double what you get at places like Bromont and Sunday River. Runs are long and there's a lot of options too. The trails are not built up with berms and tabletops as much as places like Winter Park, Whistler and Highland but they're just fun. I highly recommend this stop. Thanks for the info. As a fellow NE'r I always wonder what those places are like. How far apart are those resorts? We're going to Moab later this year and might try and hit one of those places up on our way. thnx for the report from a NE...yeah should've went to sol vista . not big mnt. but a fun one...I also likes keystone ovewr wp. Thanks so much for the post. I'm headed to Winter Park in August. I'll make sure to take a trip over to Keystone. Bummer you didn't make it....Solvista is a blend of Keystone and Winter park. Home to many of the Colorado DH race teams, it's fast,filled with rocks and has some of the best berm trails in Colorado. A must for anyone making the trip. I hate to say it but you REALLY missed out by not driving 25 mins past winterpark to Sol Vista. You can make a ton of runs in a day really nailing lines and practicing things. Big jumps and drops and rocks. I go to all of them threw out the year and solvista is my i want to scare myself and practice DH race style trails. Smaller mountain but not to be over looked. If you can find some one local to show you around Vail has some great stuff. Greg Minaar at Vail in 2005, yeah its older and there are no big jumps but its great techy single track with some jumps/berms. If you're more old school it is not to be missed. Oh and the DJ looking stuff is in Summit County. Does that DJ spot in summit county still exist? I haven't been back up in there since '99? any details on Vail? Looking to ride strictly DH... thanks! Interestingly, Vail is building a new trail. 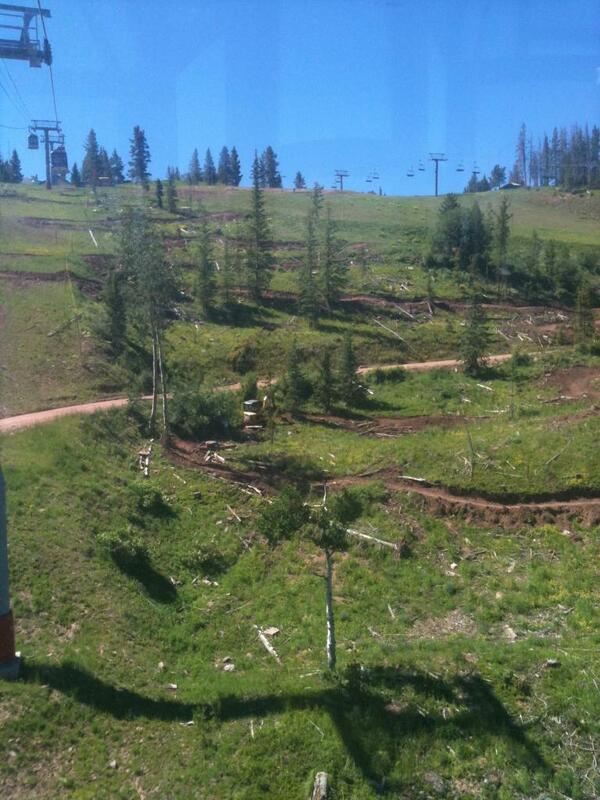 I was on the gondola on Monday and a mini bulldozer was cutting in a new trail right under the gondy. Not really sure yet what they are trying to do with it. Vail was keen surprise. As noted, maybe a bit old school, but the trails are every bit as fun as Keystone, just different. Bad video forgot to turn the go pro back to upside down mode and it was the other peoples 1st time ridding DH so not the quickest ridding but had fun. They had 01 and the 94 WC DH closed. I still like to hit it a few times a year. anyone have any recent pics/vid of sol vista or vail they'd like to share online? That drop is one of the scariest things I've done on a bike. The turn right before the drop doesn't help the nerves! Don't thank me, the only evidence I have of my drop is a crumby cell phone pic looking back up after I dropped it. That pic is MBX5's. Sweet pic of Bailey's. That spot was the talk of the town back in the early 90s when we used to try to kill ourselves high-posting it on terrifying Manitou 2 and RS Mag 21 suspension forks. 22" barz! still... like @JMH said... SWEET PIC! just curious... what kind of rig you got set up for your POV vid? mini vid cam with your own chest strap? or stock online? I rode vail today ---PMT, mane lane, magic forest etc...It's Old school DH and not "Parky" like wp. They are indeed building + adding new runs at Vail = friend told me they are adding more mellow/fun stuff due to the fact that they really only have black DH runs and glorified cat tracks/fire roads that are considered "blues and greens" for beginners and intermediates. I'll have a ride report up in two weeks from the perspective of a socal rider. I'm staying with family in Denver and driving out each day to WP, Keystone and Solvista for 5 days. Looks fun and I'm glad I'll be able to ride 3 different places. Its just a normal go pro with the stock chesty with the camera flipped upside down. New trail going in at Vail This is the second section. Counting over twenty corners. I JUST WANT A BICYCLE!!!!! " Why-why are you yelling at me?" WHATEVER, MAKE ME A BICYCLE CLOWN!!!!!!!!! I just got back from 5 days with my friend who flew in from WI. We rode Winter Park, Keystone and Vail. His favorite trail...Vail's Old Nine Line. And as far as advice, just know the trails are not labeled that well. If you can hook up with a local it would help or even ask once you're there. Old Nine is awesome! I dont know of another trail to compare it too? Best Colorado Resorts w/ Lift Service? Mtbr launches new review section for Bike Parks & Resorts! Colorado resorts late for DH this year?